“CAPTAIN MARVEL” – Brie Larson and Samuel L. Jackson star in the latest Marvel movie. “Captain Marvel” starts Friday, April 19 at the Dells Theatre. It is scheduled to play for 6 days through Wednesday, April 24. 128 minutes. It’s rated PG-13 for sequences of sci-fi violence and action, and brief suggestive language. WEEKENDS: Bargain Matinees every Saturday and Sunday for all shows starting before 6:00 p.m. All ages, all seats only $5! TUESDAYS are Super Saver Tuesdays!! All ages, all seats are only $5. Plus there’s also a special at the snack bar—you can get a small popcorn and small drink for only $5. Want a larger size? You can upgrade and still apply the $2.50 savings! JOIN OUR DIRECTOR’S CLUB AND EARN POINTS TO RECEIVE FREE POPCORN, DRINKS AND MOVIE TICKETS! 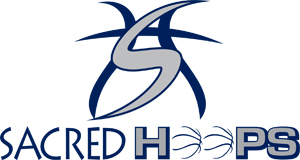 Sign up here on our website or at the boxoffice. The Dells Theatre is celebrating its 80th anniversary this month by hosting back-t0-back South Dakota premieres of two movies and bringing in the stars or producers of those movies. The art deco theatre was designed by famed Minneapolis theatre architect Perry Crosier. It opened on August 19, 1938. Logan Luxury Theatres Corporation purchased it in 1998 and is the third and current owner of the theatre. They have constantly restored and upgraded the theatre since purchasing it. “The Little Mermaid” will premiere Thursday night (August 23rd) with a special reception for actor/producer Armando Gutierrez at the Dells Rapids Museum at 5:30. At 7:00, Gutierrez will go to the red carpet event at the Dells Theatre where he will introduce the movie and answer questions following the screening. The movie will play for the next eight days through Thursday, August 30. It will start a week’s engagement on Friday, August 24 at the other Logan Luxury Theatres locations, the Luxury 5 Cinemas in Mitchell and Huron Luxury Cinemas in Huron. Armando Gutierrez plays a lead role and is the producer of the live action version of “The Little Mermaid.” This movie is based on the characters from the original story by Hans Christian Anderson. Gutierrez will be in Mitchell Friday, August 24. He will make an appearance at the new Mitchell Indoor Aquatics Center at 5:30 with a live mermaid. At 6:30, he will be driven to the Luxury 5 Cinemas for a red carpet event. Gutierrez will introduce the movie and answer questions after the movie. “The Little Mermaid” will play for one week through Thursday, August 30, and may be held over another week. In this new story, a grandmother (played by Shirley MacLaine) tells her daughters the story of the Little Mermaid but they don’t believe until she tells them a tale of her own. A young reporter finds a circus with a beautiful mermaid trapped in a glass box. The mermaid appears to the girls as a woman with legs. The girls soon learn of a prophecy about a girl born on land blessed with the heart of a mermaid. As the prophecy comes to life they become entangled in a plot by a sinister wizard. “Farmer of the Year”, which was shot around Tyler, MN and in South Dakota at the Corn Palace, will have its South Dakota Premiere on Friday, August 31. The film was written by Tyler, MN native and farmer’s daughter, Kathy Swanson. It was produced by her and her husband, Vince O’Connell, who have been taking it to film festivals around the country. 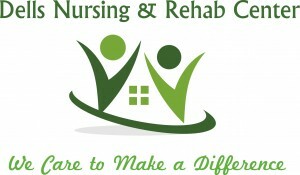 O’Connell and Swanson will be in Dell Rapids Friday afternoon (August 31st) to promote the film. They will then travel to Mitchell for a public reception with the producers at the Second Floor Art Gallery at the Corn Palace at 5:30. They will be driven to the Luxury 5 Cinemas at 6:30 for a red carpet event where they will introduce the movie. They will also answer questions following the screening. Saturday they will be at the Freedom Stage at the State Fair in Huron as guests of the SD Farmer’s Union. That evening, they will be at the red carpet event at 7:00 the Huron Luxury Cinemas to sign autographs and introduce the film. The comedy-drama is an affectionate look at farm life and generational differences. A widowed 83-year-old Minnesota farmer sells his farm to his daughter. Bored with retirement, he decides to travel with his rebellious granddaughter across country in his 40-year-old Winnebago to a reunion of his World War Two army outfit. On the way, they stop at the Corn Palace and other locations in South Dakota and Nebraska. Sioux Falls resident and Stepping Stones counselor Arin Winger along with Mitchell residents Cheryl Miller, John, Lori and Ryan Solberg have parts in the movie. “Farmer of the Year” has been selected to play at film festivals across the country. It won the Audience Choice Award at the Minneapolis St. Paul Film Festival and was an Audience Choice finalist at the Sedona, Arizona Film Festival. It was nominated for Best Feature Film and Best Actor for Barry Corbin at the Soho International Film Festival in New York City. 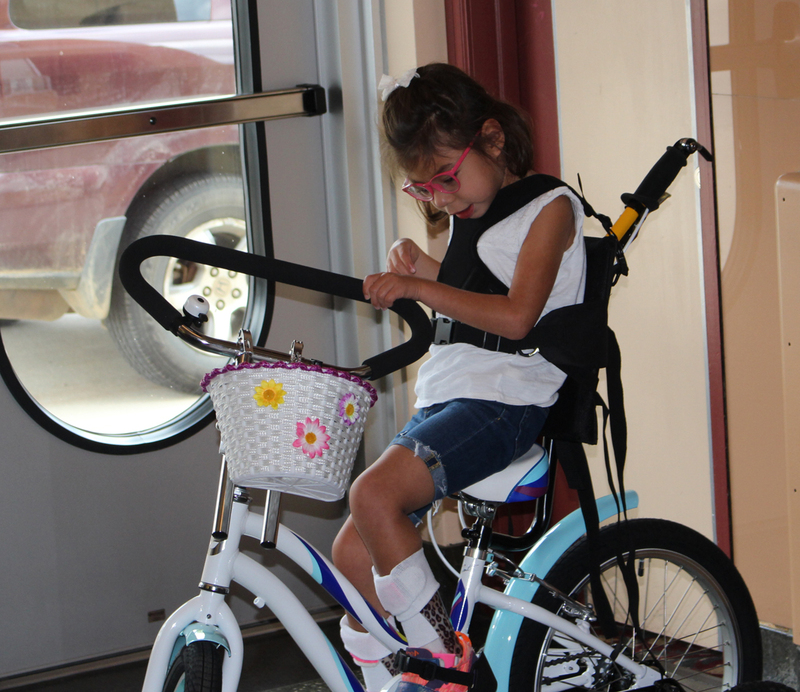 A Sioux Falls five-year-old was presented with a specially-designed bicycle at the Dell Rapids Theater on Thursday, September 8th, thanks to fundraising efforts led by Variety, a children’s charity. Phoenyx Benson is living with a significant brain injury and is unable to ride a traditional bicycle. 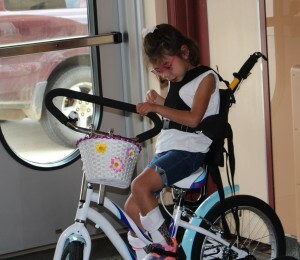 Variety has led fundraising efforts to have a specially-designed bicycle given to Phoenyx to allow her the joys of having her very own bike to ride. 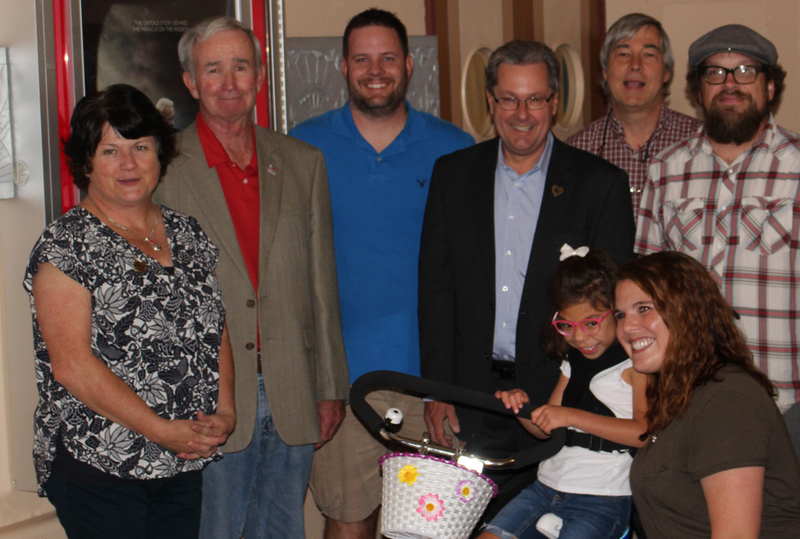 Dell Rapids Theater owner, Jeff Logan and Logan Theaters chain, have been big supporters of the Variety children’s charity. 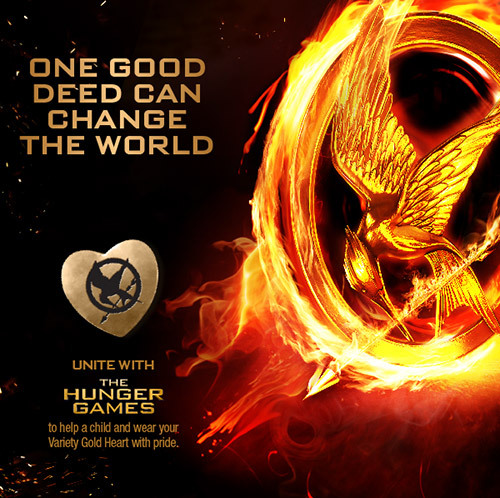 They have sold limited edition gold pins from Variety’s Gold Heart Campaign to help raise money for the charity. All the monies raised in South Dakota stay in South Dakota to help locally. This year’s pin featured artwork from the “Hunger Games: Mockingjay – Part 2″ movie. The previous pin featured artwork of the minions from “Despicable Me”. “They are like collector’s pieces. They tie in with a different movie, and we have support from the studios that they donate the license to use the artwork. They are able to use a special pin to make it more popular,” Logan said. Variety was initially founded in 1927 by a group of 11 theater owners and showmen in Pittsburgh, PA as a social club. The so-named Variety Club evolved into a charity during 1928. Today Variety has a network of 42 offices in 13 countries operating as a children’s charity. 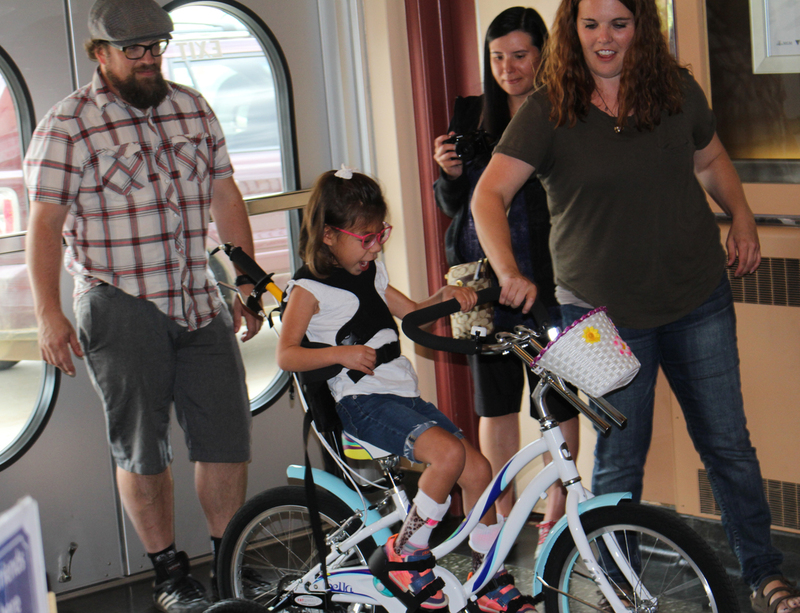 After receiving the bicycle, Phoenyx took a ride around the lobby of the theater and posed for pictures with her mother Emily Bartscher and everyone that helped make the bicycle possible. 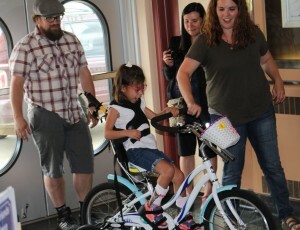 The specially-designed bicycle was made by Chad Pickard the owner of Spoke-N-Sport bike shop. The Midwest premiere of the new movie “Walt Before Mickey” will be held at the Logan Luxury Theatres in Mitchell, Huron and Dell Rapids on Friday, August 28. The producers of the film, Armando Gutierrez and Arthur L. Bernstein, will be at all three locations for the festivities. The film will show at all three theaters for one week Friday through Thursday, August 28-September 3. The producers will arrive at the Dells Theatre at 6:30 p.m., Thursday, August 27th, for the 7:00 p.m. “Red Carpet Advance Showing” where Mayor Scott Fiegen will welcome the producers to Dell Rapids and honor them with a presentation. The movie will be introduced by the producers who will also hold a question and answer discussion following the film. The movie will begin its regular showings for the week on Friday, August 28. The public is invited to the Thursday advance showing as well as all showings during the week. Premiere festivities will also be held Friday at the Luxury 5 Cinemas in Mitchell and on Saturday at the Huron Luxury Cinemas in Huron. “Walt Before Mickey” stars Jon Heder (“Napoleon Dynamite” and “Blades of Glory”) as Roy Disney. Jodie Sweetin (from TV’s “Full House”) plays Walt’s young bride, Charlotte. Thomas Ian Nicholas (“Rookie of the Year” and “American Pie”) plays the young Walt Disney. David Henrie (“Mall Cop 2” and “Wizard of Waverly”) plays artist Rudy Ising. Few people today realize the struggles and failures Walt went through before finally finding financial success before he created Mickey Mouse. 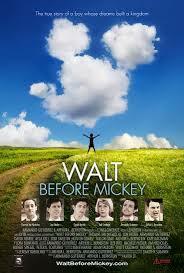 Walt assembled a team of animators who would lead animation for Disney and other studios for the next four decades. It is an inspirational story of a young man’s vision and fight to succeed despite obstacles and unfair treatment by larger companies. The producers, Gutierrez and Bernstein, also took roles in the film. Gutierrez previously produced “Henry and Me” starring Richard Gere and “Ask Me Anything” starring Britt Robertson. Gutierrez holds a graduate degree from Harvard. Bernstein is an award winning filmmaker who has produced movies, TV shows and commercials. He previously worked with Adam Sandler’s Happy Madison productions and with Burt Reynolds. He has also produced or acted in many movies, TV shows and commercials. Logan Luxury Theatres Corporation president Jeff Logan first met the producing partners at the Cinemacon Convention two years ago. Logan worked with them over the past year to develop the plan for the midwest premiere over the past year.